Thursday May 22nd 1924 It was a fine day and we had The Elder Daughters party with a May-pole dance in the yard. I had a letter from Lydia and wrote her. Rob home and away again. Friday May 23rd 1924 I was sewing some before Hattie & I went down to Fannies to spend the day. She had other company. LeGrands birthday thirty years old. Evening at home. Saturday May 24th 1924 Hattie to town in AM. She learned from Mr Bates that the State want all the house as soon as possible. I hoped to stay longer. Afternoon & evening at home. Sunday May 25th 1924 Rob got home last night and Cora this morning. We could not go to Burlington today as it rained early in the morning. Hattie and I went to S S & church with Ott. I wrote to Ida, Mattie Stitt, Lizzie Lindley, Mrs Falk and W B McCall. I was down at Otts all evening. Monday May 26th 1924 We girls to town in car an hour. Took [glass?] and flower pots away. I was home sewing most of the day. Letter from Lydia. Mollie to stay all night. We rode after supper. Nice day. Tuesday May 27th 1924 Sewing some. I was down to Fannie in AM. Rob took us to ride after supper. Fannie went with us. 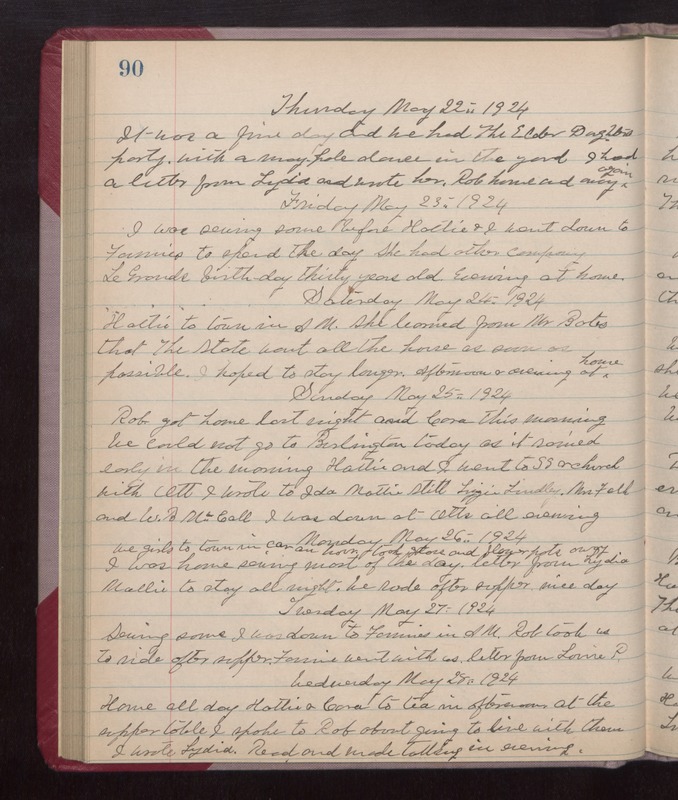 Letter from Louise P. Wednesday May 28th 1924 Home all day. Hattie & Cora to tea in afternoon. At the supper table I spoke to Rob about going to live with them. I wrote Lydia. Read and made tatting in evening.